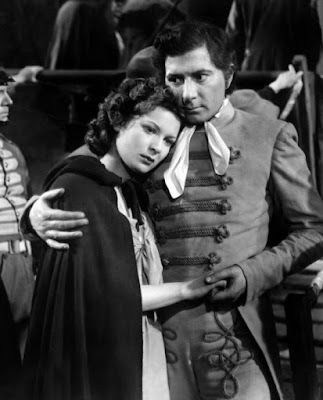 Today, I'm writing about the Alfred Hitchcock-directed swashbuckler Jamaica Inn (1939). It stars Maureen O'Hara and Robert Newton as two young people who are caught up with a gang of smugglers in 19th century Cornwall. This article is part of the Swashathon: A Blogathon of Swashbuckling Adventure hosted by Movies Silently. Jamaica Inn (1939) holds a unique place in director Alfred Hitchcock's filmography. This tale of 19th century Cornish smugglers has the distinction of being Hitchcock's only swashbuckler, and the movie that introduced swashbuckling stars Maureen O'Hara and Robert Newton to the world. Jamaica Inn begins when a young Irish woman named Mary Yellen (future pirate queen O'Hara) arrives on the rugged coast of Cornwall in 1820 to pay a visit to her beloved aunt Patience Merlyn (Marie Ney), who runs the remote Jamaica Inn with her husband, Joss (Leslie Banks). As it turns out, Joss and a villainous local squire named Sir Humphrey Pengallan (Charles Laughton) control a ruthless smuggling gang out of Jamaica Inn. After saving the life of Jem Trehearne, (future Long John Silver Newton) a government agent who is trying to infiltrate the gang, he and Mary must stay one step ahead of the smugglers or risk their ruthless vengeance. 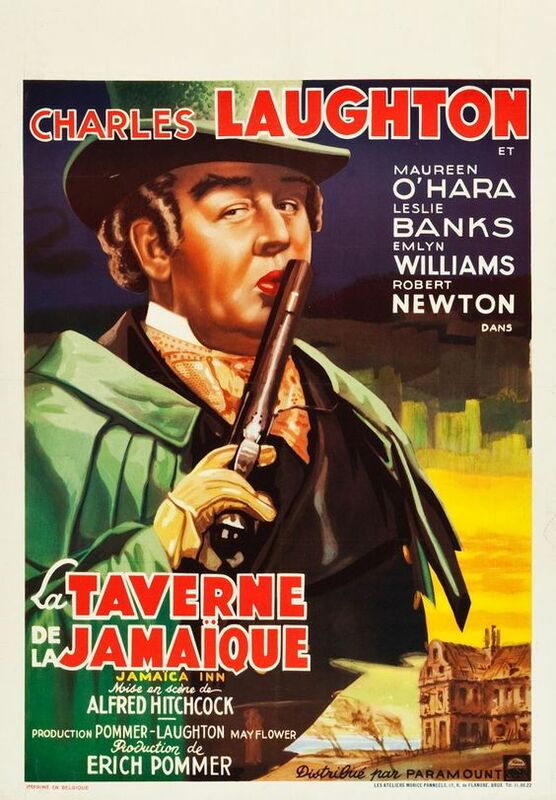 Jamaica Inn is based on a 1936 Daphne du Maurier novel that actor Charles Laughton and producer Erich Pommer optioned for their newly formed Mayflower Pictures production company. Laughton asked his old friend Hitchcock to direct the movie, and, although Hitch wasn't overly enthusiastic about the idea of making a swashbuckler, he agreed to make the film both to please Laughton and because he needed the money. At the time, Hitchcock was waiting to sign a contract with independent producer David O. Selznick, but the Hollywood mogul was taking his sweet time to negotiate a deal while he worked on his magnum opus, Gone With the Wind (ironically, Hitchcock and Selznick's first picture together was du Maurier's follow-up novel to Jamaica Inn, Rebecca). Despite his misgivings, Hitchcock prepared Jamaica Inn with his usual meticulous attention to detail. He hired his favorite screenwriting team of Sidney Gilliat and Joan Harrison to adapt the novel, and he worked on his beloved storyboards, especially for the opening scenes, which Hitchcock felt were essential for establishing the mood with an audience. However, once filming began, Hitchcock's best-laid plans were often disrupted. The loud wind and rain machines required to make a realistic English Channel storm on a studio set meant that the cast and crew were often cold, wet, and unable to hear Hitchcock's directions over the din. Alfred Hitchcock directing a scene from Jamaica Inn (1939). 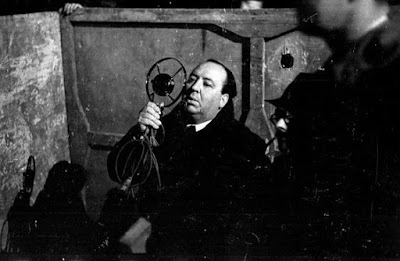 Hitchcock also had a difficult time directing Laughton, who, despite being one of the most brilliant actors to every set foot on a movie sound stage, had a torturous working method. Laughton often spent hours in his dressing room listening to period music (in order, he said, so his walk would be historically accurate) before showing up for work. The actor also had a tendency to burst into tears at unexpected moments, and he often required several takes to get an usable scene (Laughton had particular difficulty with the more villainous aspects of his role; he once told a gobsmacked Hitchcock that he imagined himself as a 10-year-old boy with only his knickers on to get into the proper mood for menacing O'Hara). Despite all these difficulties, Jamaica Inn was a hit in 1939, and it still holds up rather well today. There are good performances all around especially from Emlyn Williams as a charismatic smuggler, a feisty O'Hara in her first major screen role, and Laughton, who is absolutely mesmerizing as Sir Humphrey. Hitchcock doesn't have the natural swashbuckler instincts of a director like Michael Curtiz, but he handles the material well, particularly the impressive shipwreck scenes and the romantic banter between O'Hara and Newton. 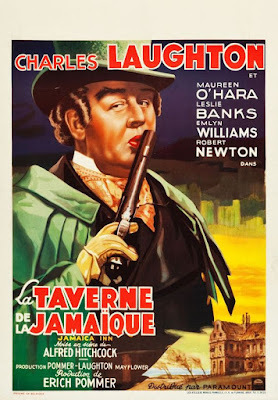 After Jamaica Inn, Hitchcock happily left the swashbuckler genre behind, but O'Hara and Newton would both become mainstays of the genre in the 1940s and 1950s. O'Hara often starred in glorious Technicolor action-adventure films like The Black Swan (1942) and Against All Flags (1952), and Newton would make a name for himself as the "pirate of all pirates" Long John Silver in the Disney film Treasure Island (1950) and several sequels. Jamaica Inn is available for streaming on Fandor. Also on DVD and video on demand. I haven't seen Jamaica Inn for a while. You have encouraged me to watch it again. Daphne du Maurier sure got around. Thank you for an interesting review. Thank you so much for joining in with the review and all the background details! This does seem to be a case of some great talents who just didn't mesh personally but what an interesting picture. It is interesting and underrated. It's not the typical Hitchcock film, but it makes for a fun night at the movies. This sounds fascinating. It is so interesting to read about early works of artists I know well like Maureen O'Hara and Alfred Hitchcock. Before the Swashathon, I had no idea that Maureen O'Hara was a piratess. Now, yours is the second article to mention this. I love the details your provided, such as those about Mr. Laughton's eccentric practices. 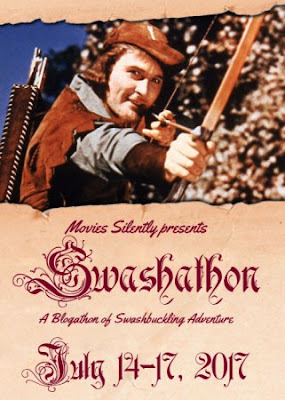 I wrote the following article for the Swashathon: https://wordpress.com/post/pureentertainmentpreservationsociety.wordpress.com/3672. I hope you read and enjoy my article as much as I enjoyed yours. I knew O'Hara until recently for her work with John Wayne, but she is great in these swashbucklers. Great article, it made me think about the movie in and of itself. I tried watching it once, just after I had rad the book. And the book is so vicious - I mean, in the book they are - what are they called? Wreckers - who destroy boats off shore - nasty stuff - and I was actually turned off by how un-vicious the movie is in comparison. But your article really makes me appreciate the movie for itself! And I had no idea this was Maureen O'Hara's first big role!